I have a degree in commercial illustration and many years experience in commercial printing, graphic design, illustration, caricature, and cartooning. My first cartoon was published in Starlog Magazine, the top science fiction periodical in the world with a print run of about 600,000. 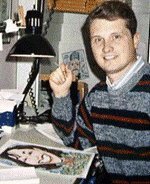 In 1991, I became the official cartoonist of the Air Force Reserve and have branched out into numerous other Air Force and veterans magazines and newspapers. 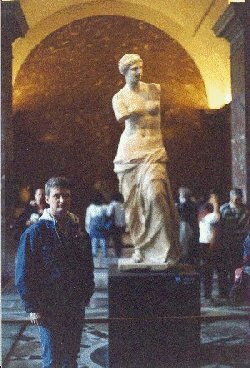 Me at the Louvre decoding Venus. What the bajeepers is this W.C. stuff?!? Growing up I was constantly drawing, with paper and pencil in hand. From the paper grocery bags to the left over paper from the local newspaper that my grandmother would bring home to me. I would draw on anything and get into trouble for it! One of my secrets to drawing cartoons is that I always carry around a drawing book or small reporters notebook. So any free moment I have or when I see something funny I put it down. It could be as simple as a word or an idea. Later, when I'm sitting at the drawing table I flip through and draw up the cartoons. Instead of a regular pencil, I use a non-repro blue pencil and draw lightly so that I don't have to take the extra step of erasing my pencil lines. You can see all of that explained on the Cartooning Class page. Oh, yes the W.C. stuff, well, it's the initials for William Charles which is my given name. But since there are about three million other cartoonists by the name of Bill out there I figured the W.C. would be more catchy. What do you think? Also If you are in the upstate New York area I do caricatures at Corporate Parties, Birthday Parties, College events. If interested you can email me or call me at the number at the bottom of the page. That's me! Little ol'me drawing in my studio with one of the coolest sweaters ever!